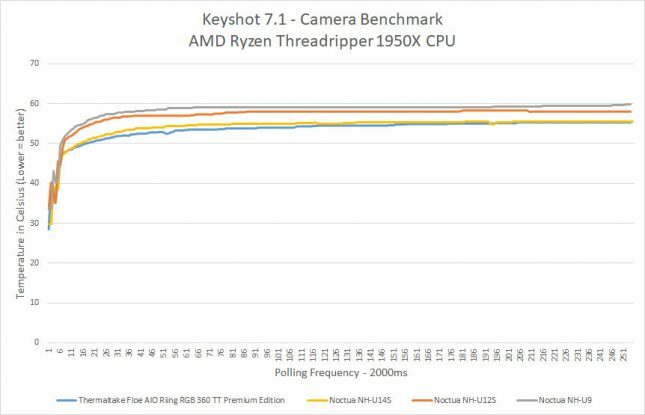 We wanted a real world benchmark that would put the AMD Ryzen Threadripper 1950X 16-core, 32-thread processor at full load, so we turned to Keyshot: 3D Rendering and Animation software. 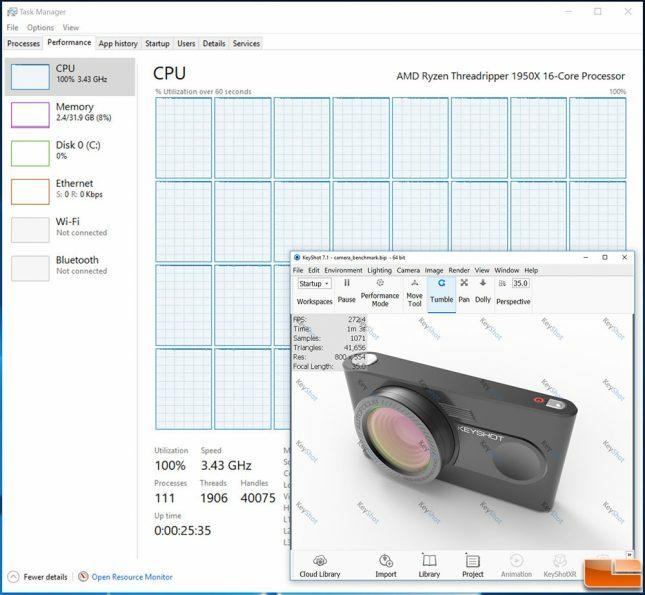 We ran Keyshot 7.1 with the built-in camera benchmark and found that the Ryzen Threadripper 1950X was again at 178W for the CPU Package Power and this time around the CPU was at 100% load on all 16-cores and 32-threads. CPU Tdie temperatures were much lower on Keyshot 7.1 despite the higher CPU load levels, so that was interesting. Here we found the Noctua NH-U14S TR4-SP3 to top out at 55.5C and that was slightly higher than the 55.0C on the Thermaltake Thermaltake Floe Triple Riing RGB 360. The Noctua NH-U9 TR4-SP3 came in at 59C and then the Noctua NH-U12S TR4-SP3 finished slightly better at 58C. Not a huge difference between these four coolers considering they range in price from $70 all the way up to $200 and there is just a 4C difference on a benchmark like this. Why would the temperature be lower in a test where there is 100% CPU load versus one that has only around 50% CPU load? 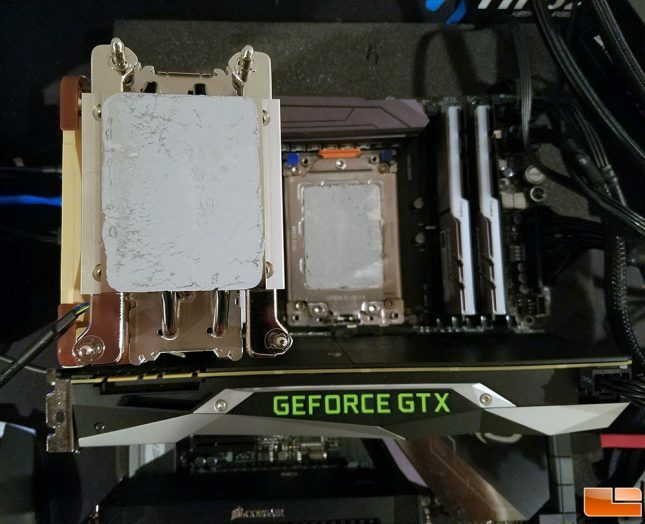 Let’s dive deeper into some of the numbers on the Noctua NH-U12S TR4-SP3 cooler test logs. 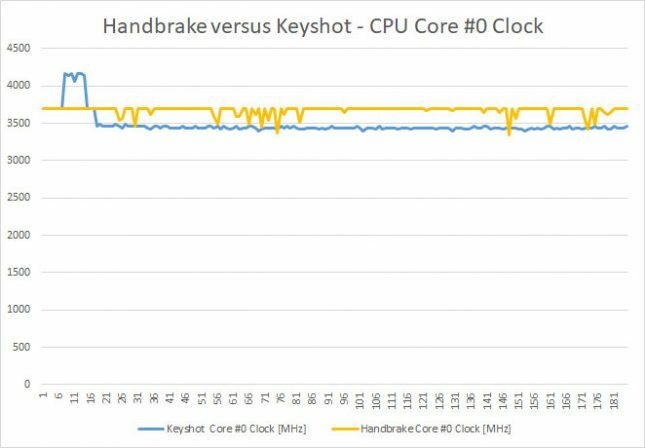 Taking look at CPU Core #0 we can see that the cores are running at 3692MHz for nearly the entire benchmark run on Handbrake whereas on Keyshot they spike up to 4166MHz when the application is open, but drop down to around 3440MHz once the render begins. When it comes to voltages on CPU Core #0 we found that Keyshot with each core at 100% load stabilized out to around 3440MHz and the voltage was right around 1.08V the entire run. 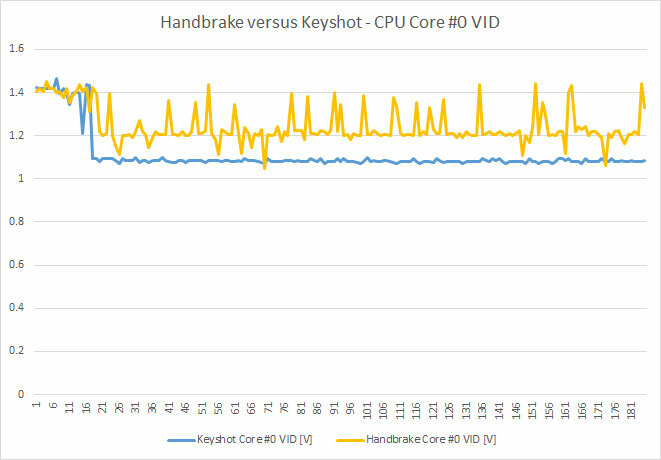 Handbrake on the other hand was running higher at around 3692MHz the entire run with the voltage bouncing around 1.2 to 1.44V over the course of the workload. Handbrake might not have the cores at full load, but they are being run at a higher clock speed and voltage as a result. It is shocking how well these three high-end heatsinks from Noctua handle AMD’s TR4 and SP3 sockets for their latest Ryzen Threadripper (X399) and EPYC platforms. The new TR4-SP3 versions of the award-winning NH-U14S, NH-U12S and NH-U9 coolers perform so well thanks in part to the larger contact surface. 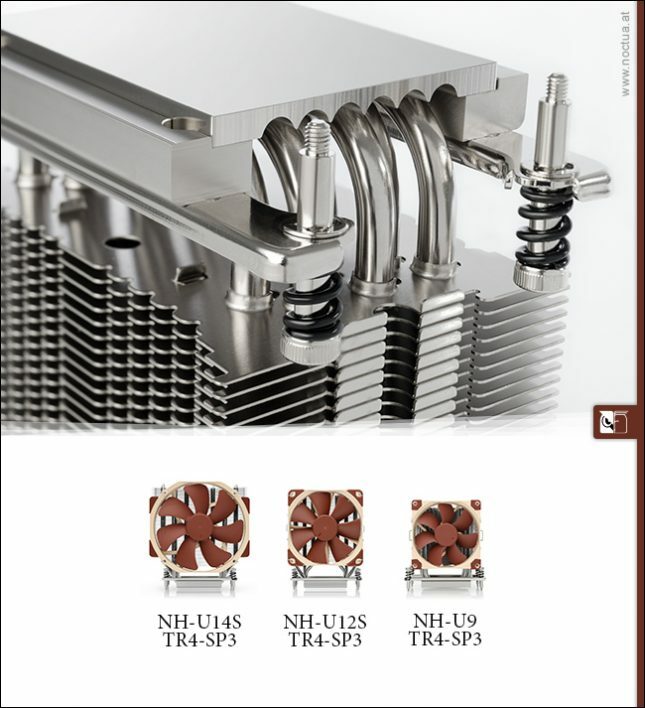 Noctua more than doubled the size of the ‘base plate’ on the new TR4-SP3 coolers and they make full contact with the processor! The Noctua SecuFirm2 mounting system for TR4/SP3 was simple to use as all we needed to do was take the Noctua cooler out of the box, apply the thermal compound and tighten the bolts with the included allen wrench. Each cooler comes with either the NF-A15, NF-F12 or NF-A9 premium fans, so you get solid cooling performance with the quietness of their latest generation fans. One of the other nice features of these fans is that the SecuFirm2 mounting solution for TR4/SP3 platforms makes it possible to offset the cooler by 3 or 6mm towards the upper edge of the motherboard, thereby increasing clearance of the top PCIe slot. This is needed for some X399 boards as the massive NH-U14S TR4-SP3 CPU cooler could block the first PCIe slot if you don’t offset the mount as seen in the image above. 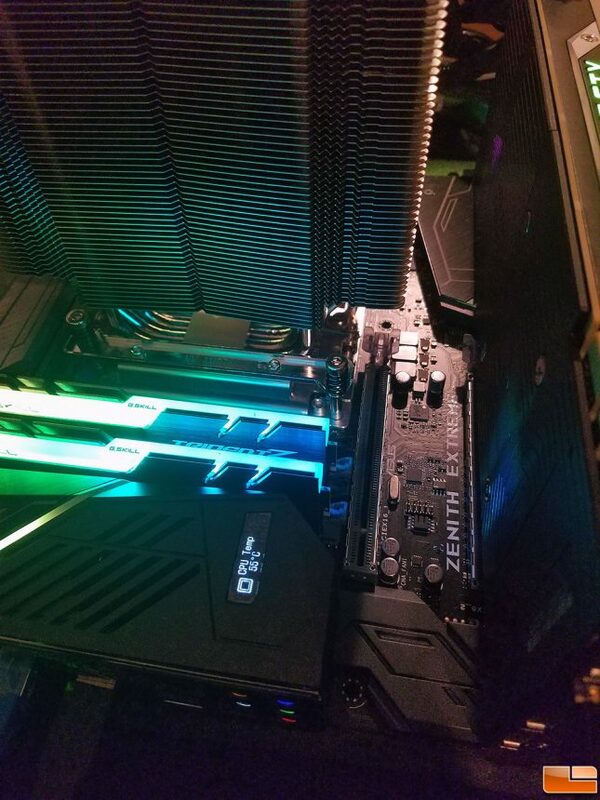 The first slot on the ASUS ROG Zenith Extreme X399 was blocked no matter the offset, so be prepared to lose a slot on some boards. What Noctua CPU cooler is right for your Ryzen Threadripper or EPYC platform? At the end of the day it all comes down to space. The Noctua NH-U9 TR4-SP3 ($69.90 shipped) has push/pull dual 92mm fan configuration that gives is solid cooling performance in a pretty compact size. Its height of only 125mm allows it to fit smaller cases and most 4U size rack-mount enclosures. The only downside to this is the fact that it is the loudest of the bunch since there are two fans and they are spinning at nearly 2,000 RPM. The larger Noctua NH-U14S TR4-SP3 and NH-U12S TR4-SP3 are supplied with one of Noctua’s premium-grade NF-A15 PWM and NF-F12 PWM fans and cool better than their compact sibling. Just make sure you measure your chassis to ensure that they fit in your enclosure. 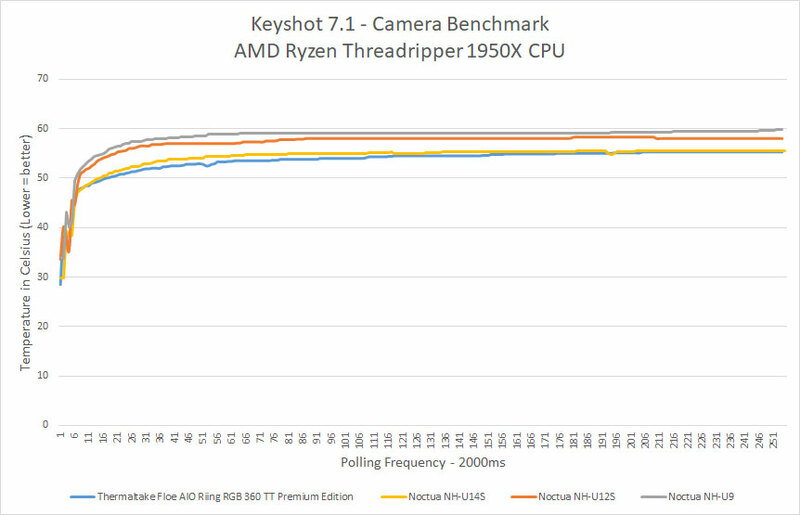 If you plan on building an AMD Ryzen Threadripper or EPYC platform and don’t plan on going crazy with an overclock the Noctua NH-U14S TR4-SP3, NH-U12S TR4-SP3 and NH-U9 TR4-SP3 all provide outstanding performance and cost under $80. They also come with NT-H1 thermal compound, a 6-year warranty and the peace of mind that comes from never having to worry about a water leak. Legit Bottom Line: Noctua came up with some great air cooling solutions for Ryzen Threadripper and EPYC platforms that hold up well against more expensive water cooling solutions at stock settings.